Last updated on: 12 October 2015. Anastasia Rodionova (Russian: Анастасия Родионова; born 12 May 1982 in Tambov) is a Russian-born Australian professional tennis player. Rodionova has won nine doubles titles on the WTA tour, as well as eight singles and thirteen doubles titles on the ITF tour in her career. On 16 August 2010, she reached her best singles ranking of world number 62. On 8 September 2014, she peaked at world number 15 in the doubles rankings. Rodionova's greatest career achievements have come in doubles, having reached the finals of the Mixed Doubles event at the 2003 Wimbledon Championships with Andy Ram and the semifinals of the Women's Doubles event at the 2010 US Open with Cara Black. Rodionova's younger sister Arina is also a tennis professional, and the two sisters have intermittently contested doubles tournaments with modest success. Their most notable achievements as a team came at the 2010 Malaysian Open and 2015 Monterrey Open, succumbing in the super tie-break in the finals of both tournaments. Rodionova started to play tennis at age 7, but she was introduced to tennis much earlier. Her father Ivan was an amateur player so instead of toys, Rodionova had tennis balls in her pram. He coached her until 18 years old when she left Tambov, Russia and moved to Germany to practice for 3 years before returning to Moscow to live in 2003. She has resided in Melbourne, Australia since 2005. Rodionova's sister Arina has also been a professional tennis player since 2004. In 2006, after reaching the 2nd round in the 2nd tier tournament in Los Angeles, Rodionova entered the Top 100 WTA rankings for the first time in her career. At the US Open she became one of the leading players after making it to the 3rd round (her best result in singles at a Grand Slam tournament to date). This catapulted Rodionova to 81 in the world. In doubles with Elena Vesnina she also reached the WTA tournament final in Bangalore, India and she captured her 11th ITF title in Italy in partnership with her sister Arina Rodionova. In 2007 Rodionova played a whopping 28 WTA tournaments. At the Australian Open Grand Slam she reached the 2nd round but lost to world number 2 and eventual finalist, Maria Sharapova. In Miami's Tier 1 tournament Rodionova took more games off the eventual tournament champion Serena Williams in her 2nd round defeat than any other person in that tournament. In the Estoril Open, Portugal, Rodionova won her 2nd title in doubles with Andreea Ehritt-Vanc from Romania. Together they also made the finals in Morocco. In the 1st tier tournament in Los Angeles Rodionova made the semi-finals, partnering with Tatiana Poutchek. In Guangzhou, China Rodionova reached the singles semi-final but was unable to finish the match due to heat stroke. At the Tashkent Open, Rodionova once again teamed up with Tatiana Poutchek making the final, but lost in 3 sets to Ekaterina Dzehalevich and Anastasiya Yakimova. Rodionova ended the year ranked 78th place in singles. Rodionova started the new 2008 season in New Zealand, but it began unsuccessfully as she was forced to retire in the opening round due to eye problems, where she was experiencing double vision. After a short-course of treatment in Melbourne, Rodionova began preparations for the Australian Open. There she played under the Australian flag for the first time and reached the 2nd round, losing to Katarina Srebotnik. ((cn)) In the next few tournaments of Pattaya, Doha and Dubai Rodionova struggled with her vision with three 1st round defeats in singles, but made a doubles semi-final with Arina at the Pattaya Open. Then success increased remarkably, resulting in her gaining several considerable victories over the multiple top 30 players. In India she defeated the number 20 in the world Sybille Bammer from Austria on the way to the quarter-final, where she went down to Serena Williams. She carried that confidence through the USA series, passing qualification in Miami and reaching the 2nd round and making the 3rd round in Charleston, losing to Jelena Janković. May 2008 saw the beginning of a spate of injuries that significantly hampered the rest of her year, taking 1st round honours in tournaments that she would have otherwise performed much more brightly. Movement did not restrict her as much in doubles and she made quarter finals in a Moscow ITF, semi-finals in New Haven, 3rd round in the US Open, and semi-final in Guangzhou. However, it was clear that without major hip surgery, Rodionova's career would forever be handicapped so in September she underwent a specialised operation in Melbourne and spent the remainder of the year in rehabilitation. 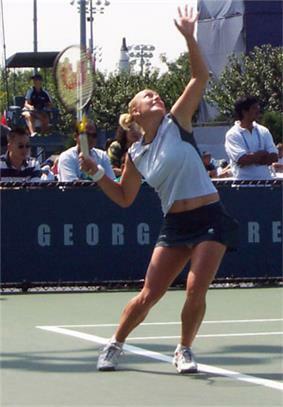 Results were restricted significantly for the first half of the year while Rodionova strengthened her hip and built on-court fitness following the major hip operation in September 2008. She sustained a badly sprained ankle during 1st round singles at Los Angeles in July and was forced to retire. Rodionova represented Australia at the US Open and equalled her career best 3rd round in singles before returning home to Melbourne to receive intensive treatment on a heavily injured ankle and torn leg muscle. She withdrew from the tournament in Seoul to complete treatment and rejoined the WTA Tour in Tokyo, Japan. Rodionova's final tournament for 2009 was in Poiters, France and she ended her season ranked back inside the Top 100 at 97. Rodionova started the year the Brisbane Open falling in qualifying but making the doubles final. Then played Sydney fell in the last round of qualifying to Kimiko Date-Krumm, At the Australia Open Rodionova lost to Kuznetsova 6–1 6–2, but partnered with Vera Dushevina to make the 3rd round of doubles, knocking off 5th Seeds Nadia Petrova and Sam Stosur en route. Rodionova then played numerous tournaments in Asia and Arab Emerates. Highlighted by a Quarterfinal showing at Kuala Lumpur, and 2nd round loses at Dubai and Pattaya City. Rodionova lost in qualifying at Indian Wells but qualified for the main draw of Miami. In doubles, Rodionova and her sister Arina Rodionova reached the finals in the 2010 Malaysian Open. The Rodionova sisters defeated top seeds Yan Zi and Alisa Kleybanova in straight sets in the second round. However, in the finals, they lost to second seeds Zheng Jie and Chan Yung-Jan in a close two-setter and match tie breaker 7–6(4) 2–6 [7–10]. Rodionova's debut for the Australian Fed Cup team was in Kharkov, Ukraine on 24 April 2010, where she opened the tie with an emphatic win over Alona Bondarenko, coming back from losing the first 7 games, 0–6 6–3 7–5. This gave Australia a commanding 1–0 lead that set up Sam Stosur for 2 straight forward wins in her singles matches for a 3–0 defeat of Ukraine, securing Australia's place in World Group I for 2011. Rodionova also partnered with Rennae Stubbs to win the final rubber of doubles after Alicia Molik won her substituted singles match, giving Australia a decisive 5–0 victory in the tie. In the French Open, Rodionova defeated Ekaterina Makarova in the first round 6–3 6–2. Then caused an upset in the second round by defeating the 22nd seed Vera Zvonareva 6–4 6–4. However she lost in the third round against fellow Australian Jarmila Groth 3–6 7–5 2–6. At the Wimbledon Championships, Rodionova defeated Anne Keothavong 3–6 6–2 6–4 in the first round. She then upset the 19th seed Svetlana Kuznetsova in the second round 6–4 2–6 6–4 before falling to the 9th seed Li Na 1–6 3–6 in the third round. Rodionova's next tournament was at the 2010 Western & Southern Financial Group Masters and Women's Open, where she entered as a qualifier, but lost in the first round to Vera Dushevina 2–6 6–7(7). However, in the doubles tournament, she partnered with Cara Black, as the 8th seed. They won their first round match against the Spanish pair Nuria Llagostera Vives and Arantxa Parra Santonja with a score of 6–3 6–4. In the second round, Rodionova and Black defeated Meghann Shaughnessy and Elena Vesnina 6–7(7) 6–1 10–6. Into the quarterfinals, they were defeated by the 2nd seeds Gisela Dulko and Flavia Pennetta. Rodionova reached her career high singles ranking of world number 62 on 16 August 2010. Immediately following the Cincinnati Masters, Rodionova played her next tournament at the 2010 Pilot Pen Tennis tournament, where she entered as a qualifier. She defeated Tsvetana Pironkova in the first round 6–1 7–5, but lost to 6th seed Marion Bartoli 3–6 1–6 in the second round. In doubles, she paired with Cara Black as the fourth seeds. They lost in the first round to Anabel Medina Garrigues and Yan Zi 4–6 6–3 10–12. At the 2010 US Open, Rodionova defeated Bojana Jovanovski in the first round. She fell to fellow Australian Samantha Stosur in the second round. In doubles, Rodionova continued her partnership with Cara Black as ninth seeds. The pair defeated alternative pair Alberta Brianti and Urszula Radwańska in the first round 6:2 6:3. In the second round, they defeated Alla Kudryavtseva and Darya Kustova 6:4 6:1. They defeated their German opponents Julia Görges and Anna-Lena Grönefeld 2:6 6:4 6:2 to advance to the quarterfinals, where they then defeated the 14th seeds Elena Vesnina and Vera Zvonareva in three sets. Black and Rodionova were finally defeated by 6th seeds Vania King and Yaroslava Shvedova in the semis. Advancing into the semifinals of a grand slam for the first time, Rodionova has reached her career-high doubles ranking of world number 28. Following her US Open appearance, Rodionova returned home to Melbourne before flying to South Korea to compete in the 2010 Hansol Korea Open. She lost to former compatriot and 2nd seed Anastasia Pavlyuchenkova in the first round, before failing to qualify for the 2010 Toray Pan Pacific Open. Rodionova represented Australia at the 2010 Commonwealth Games as the top seed in singles, doubles, and mixed doubles (with compatriots Sally Peers and Paul Hanley, respectively). In singles, she received a bye into the second round, where she crushed Larikah Russell 6:1 6:3. Rodionova then defeated Heather Watson 6:0 6:2. She booked a spot into the final defeating her doubles partner Sally Peers 6:3 6:7 6:1. In the final after a good start Rodionova came close to defeat with growing Indian support for the home favourite Sania Mirza, but was able to win 6:3 2:6 7:6. In doubles, Peers and Rodionova won gold, beating compatriots Olivia Rogowska and Jessica Moore in an all-Australian final. In mixed doubles, Rodionova and Hanley encountered a tough first round match against Indian pair Nirupama Sanjeev and Rohan Bopanna but ended up winning 6:3 3:6 6:3. They followed up this win by beating Mhairi Brown and Jamie Murray 6:3 6:4, and following that, defeated Sarah Borwell and Ken Skupski, earning their place in the gold medal final match but went down to Scot's Colin Fleming and Jocelyn Rae 6:7 7:6 2:6. Rodionova ended the 2010 season with a ranking of 64 in the world. Anastasia made her 2011 debut at the Brisbane International. She drew Bojana Jovanovski in the first round and lost in three sets. She continued her partnerships with Cara Black as they advanced to the semifinals before losing to Russians Alisa Kleybanova and Anastasia Pavlyuchenkova 3:6 5:7. She was next granted a wildcard to play in the 2011 Medibank International Sydney where she lost to 8th seed and eventual champion Li Na. At the 2011 Australian Open, she played Flavia Pennetta in the first round and lost. Anastasia and Cara beat three doubles teams before losing to Nadia Petrova and Liezel Huber. In mixed doubles, she partnered with Mahesh Bhupathi and won 2 matches. They were unable to play in the quarterfinals due to an injury Bhupathi sustained in his men's doubles game. Her next tournament is at the BNP Paribas Open, where she lost to qualifier and doubles partner Monica Niculescu in the first round. In doubles, Rodionova and Nicelescu lost to 1st seeds Gisela Dulko and Flavia Pennetta in the opener. Anastasia next played at an ITF $100,000+H event in The Bahamas, where she was the 7th seed. She drew Ukrainian qualifier Olga Savchuk in the first round, and ended up prevailing in a tough 3-set match, 6:4 6:7(3) 7:5. She lost to eventual champion Anastasiya Yakimova in the second round. In doubles, she partnered with her sister Arina, and lost to #2 seeds Edina Gallovits-Hall and Monica Niculescu in the first round. Anastasia's next tournament was the Sony Ericsson Open. She lost to Johanna Larsson in her first round match. In doubles, she partnered with Chuang Chia-jung and lost in the first round to wildcards Andrea Petkovic and Ana Ivanovic in three sets. She began her clay court season at the Family Circle Cup in Charleston. She played Zuzana Ondrášková in the first round and won 4–6 6–1 6–2. This is Rodionova's first win in the 2011 WTA singles tour. In doubles, she partnered with Alla Kudryavtseva. They beat wildcards Shelby Rogers and Patty Schnyder in the opener. In the second round, they lost to eventual champions Sania Mirza and Elena Vesnina. Following the Family Circle Cup, Anastasia participated in Fed Cup and lost both singles matches to Lesia Tsurenko and Olga Savchuk. Her and Jarmila Gajdošová also lost their doubles match. Rodionova travelled to Portugal to compete in the Estoril Open. She played Alla Kudryavtseva and lost in three sets. In doubles, she paired with her sister and beat #3 seeds Yan Zi and Zhang Shuai. They were forced to withdraw from their quarterfinal match due to a left adductor injury Anastasia suffered beforehand. She then played at the 2011 Mutua Madrileña Madrid Open. As the 7th seed in qualifying, she breezed past compatriot Casey Dellacqua 6–4 6–2. She then lost to Nuria Llagostera Vives in the qualifying competition. In doubles, she is playing with Nadia Petrova. They beat Vera Dushevina and Tatiana Poutchek in the first round. In round 2, they lost to Sania Mirza and Elena Vesnina. Anastasia continued her clay court season by playing qualifying at the 2011 Internazionali BNL d'Italia as the 9th seed. She easily defeated Vania King 6–0 6–3. In the final round, she faced 2nd seed Zheng Jie and lost the first set; however, she ultimately won 3–6 6–2 7–5 in 2 hours and 17 minutes. In the first round of the main draw, Rodionova defeated Kazakh Yaroslava Shvedova 6–4 6–4. She is up against World No.1 Caroline Wozniacki in the second round. In doubles, Rodionova and Petrova advanced to the quarterfinals before losing. She then lost in the first round of the Brussels Ladies Open. At the French Open, she caused a major upset in the first round by defeating doubles partner and 26th seed Nadia Petrova in three sets. She is up against Romanian Edina Gallovits-Hall next. In doubles, Rodionova and Petrova are seeded ninth. They will play Alberta Brianti and Petra Martić. She is also competing in mixed doubles, with Mark Knowles. They lost the eventual champions Casey Dellacqua and Scott Lipsky in the first round. Rodionova lost to Christina McHale in the first round of the Aegon Classic. At Wimbledon, she lost to Andrea Hlaváčková in the first round. In doubles, she continues her partnership with Nadia Petrova. They are currently playing in the quarterfinals. Rodionova's first tournament back was the 2011 Bank of the West Classic, where she was defeated by Serena Williams in the first round in under 45 minutes. She partnered with Arina and lost in the quarterfinals in doubles. At the 2011 Mercury Insurance Open, she defeated Olga Govortsova in a tough three sets. She lost to 4th seed Peng Shuai in the second round. She then qualified for the 2011 Western & Southern Open and had a great win over Polona Hercog with an amazing score 6–0 6–0 in first round but fell in the second round to Sharapova. Then she qualified in New Haven winning 3 tough matches but had a tough task in the first round and lost to Bartoli. Rodionova entered the 2011 US Open ranked World No. 97. She lost to Alla Kudryavtseva in the first round. As a result of her not being able to defend her 2010 US Open points, Rodionova fell to No. 125 in the WTA rankings, her lowest ranking since 2009. She then lost in the first round of the 2011 Guangzhou International Women's Open. In doubles, she fell in the quarterfinals. Anastasia showed a great form by qualifying in Tokyo. She lost only 3 games in total in both matches in qualifying, then she played a good match against Ivanovic but lost in 1st round. She reached quarterfinal in doubles with Irina Begu by beating polish doubles specialists in 1st round Jans/ Rosolska but lost to 2nd seeded Dulko/Pennetta. Anastasia finished the season with a great run in singles in Linz reaching the quarterfinals and a week after getting into the Final of doubles in Kremin Cup in Moscow. Rodionova began her 2012 season at the 2012 Brisbane International, where she fell in the second round of qualifying. She received a wildcard to play in the main draw of the 2012 Moorilla Hobart International. Anastasia defeated Gréta Arn in the first round, but fell to countrywoman Jarmila Gajdošová in three sets in the second round. In the 2012 Australian Open, Rodionova lost to then-ranked World No. 1 Caroline Wozniacki in the first round. She then competed at the 2012 PTT Pattaya Open. She easily advanced to the second round where she played 4th seed Maria Kirilenko. Rodionova was two points from winning the match before Kirilenko fought back to win the match in a final set tiebreak. She fared even better in doubles, winning the title alongside Sania Mirza. The doubles crown in Pattaya marks Rodionova's fourth WTA Doubles title. At the Premier 2012 Qatar Ladies Open, she did not play singles. Instead, she played in the doubles competition with Nuria Llagostera Vives, as the 5th seeds. They lost in the semifinals to Raquel Kops-Jones and Abigail Spears in three sets. She then fell in qualifying of the 2012 Dubai Tennis Championships, 2012 BNP Paribas Open, and 2012 Sony Ericsson Open. Rodionova then lost to Alizé Cornet in the second round of an ITF tournament. Following this, she competed at the 2012 Family Circle Cup, a premier event on the WTA tour. As a direct entrant in the main draw, she defeated Melinda Czink in the first round before stunning World No. 27 Anabel Medina Garrigues in straight sets, in the second round. She was eventually beaten by 2004 champion Venus Williams in the third round 7–5 6–2. Despite the loss, this was Rodionova's best performance of the year thus far. Rodionova next tournament was the 2012 e-Boks Open in Copenhagen. She lost to Kaia Kanepi. She then traveled to Morocco to participate in the WTA's lone African event, the 2012 Grand Prix Sar de la Princesse Lalla Meryem. She suffered another defeat, this time to Chanelle Scheepers. She then lost in the qualifying rounds in Estoril. She continued her clay season, competing at the 2012 Mutua Madrid Open, where she qualified for the main draw, but lost in the first round to Czech Andrea Hlaváčková. This saw her ranking drop 14 spots to World No. 106. In Rome, she again qualified for the main draw before losing a disappointing match to in-form German Angelique Kerber 6–4, 5–7, 2–6. Rodionova then lost in the qualifying draw of the 2012 Brussels Open and in the first round of the main draw of the 2012 French Open. Rodionova began her grass court season at the 2012 Aegon Classic. She won her first round match, scoring a patchy 7–6(3), −6, 6–1 win over World No. 466 Abigail Spears. She wouldn't progress much further, losing to Stéphanie Foretz Gacon in straight sets, in the second round. At the 2012 UNICEF Open, she lost in the first round of qualifying to former countrywoman Daria Gavrilova, as she retired late in the second set due to a neck injury. At the 2012 Wimbledon Championships, she was drawn against then-World No. 1 Maria Sharapova and lost 2–6, 3–6. She started her hard court season at the Premier-level Rogers Cup in Montreal. She lost in the qualifying draw. Next, she played at New Haven, where she lost in the second round of qualifying to World No. 545 Sachia Vickery, after retiring 3–6 due to illness. Having tumbled down the rankings to a lowly No. 163, she entered the qualifying tournament of the 2012 US Open for the first time since 2009. She qualified for a place in the main draw by winning three consecutive matches against Tetiana Luzhanska, Caroline Garcia, and Verónica Cepede Royg. In the first round of the main draw, she drew American wildcard Julia Cohen and defeated her 6–3, 6–0. This was Rodionova's first Grand Slam Main Draw win in 16 months. However, she lost easily to Varvara Lepchenko 2–6, 2–6. In doubles, she paired with Galina Voskoboeva and lost in the second round of the tournament. In Mixed Doubles, she played with Jean Julien Rojer, and reached the quarterfinals before losing to eventual champions Ekaterina Makarova and Bruno Soares. Then ranked World No. 130, Rodionova played World TeamTennis with the Washington Kastles alongside her sister Arina. Rodionova then competed at the Coleman Vision Tennis Championships in Phoenix, Arizona, as the fourth seed in singles. She suffered a disappointing three-set loss to World No. 477 Sachia Vickery for the second time in the season. She then played at a $50K tournament in Las Vegas. She lost in the semifinals to Lauren Davis, but won the doubles title with her sister. Rodionova then played at the 2012 Generali Ladies Linz, losing in the first round of qualifying to Jana Čepelová. Her final tournaments of the year included a first-round loss in Moscow to Alizé Cornet and a quarterfinal appearance at a $75K challenger in Ismaning. Rodionova ended the year ranked No. 134 in singles and No. 23 in doubles. Rodionova began her 2013 season playing at the ASB Classic in Auckland. She lost in the second round of qualifying when she was forced to retire against Maryna Zanevska. In the doubles tournament, she partnered with relative-comeback Cara Black and defeated three seeded teams along the way, to win her 5th WTA doubles title. At the Australian Open, Rodionova was the 19th seed in qualifying, losing in the 2nd round of qualiyfing to Valeria Savinykh in three sets. It was the first time Rodionova failed to appear in the Main Draw of a Grand Slam since the 2009 Wimbledon Championships. In doubles, her and Cara Black lost in the third round to Nuria Llagostera Vives and Zheng Jie. Rodionova continued on the WTA tour, winning her way through qualifying in her next two tournaments in Pattaya City and Doha. In Pattaya City, she won her first round match against Vania King before losing to 4th seed Sorana Cîrstea. In Doha, she defeated Zheng Jie 6–2 6–3 before losing to 4th seed Agnieszka Radwańska in the 2nd round. Rodionova then fell in the first round of Dubai qualifying to Ekaterina Bychkova. While in singles she continued playing in the style of the previous season, Rodionova showed progressive results in doubles, when partnering with Alla Kudryavtseva the duo claimed three out of four tournaments. They also reached semifinals of Beijing and Cincinnati, and quarterfinals of Wimbledon, Miami, Doha and Wuhan. That gave the pair a ticket to the Championships in Singapore, where they beat in the quarterfinals fourth seeded Makarova/Vesnina, 4–6, 6–2, [10–6]. In the semifinals they were defeated by title defenders Su-wei/Shuai, 1–6, 4–6. Her best singles result came at the Sara Errani in round 2, 4-6, 6-7.